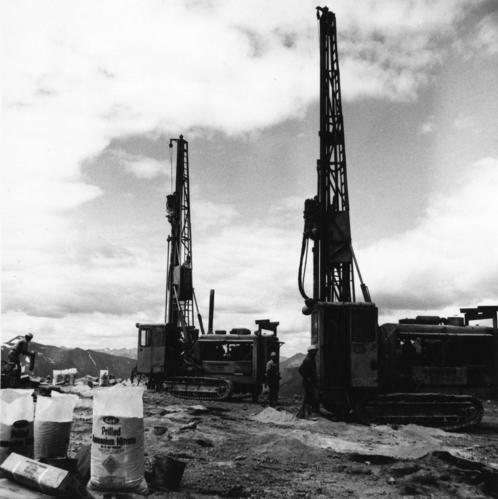 Photograph depicts men standing near two Atlas Copco Drillmasters (blasthole drills). These are precision hammer drills which had their own power source. Large bags of ammonium nitrate in foreground, mountaintops in background. The men depicted here were likely members of the explosive crew. It is believed that this photo was taken on the North ridge, near the cirque dump. Handwritten annotation on verso of photograph: "1961". Item is part of the Cassiar Asbestos Corporation Ltd. fonds. Item is one of 32, see items 2000.1.1.3.19.1 - 2000.1.1.3.19.32. See also items 2000.1.1.3.19.6 & 2000.1.1.3.19.7 for similar content.